Today, I want to share with you a quick and easy Pinterest tip. How to rearrange pins on Pinterest. This is a great way to make sure your content gets seen by as many eyes as possible. If it’s way down at the bottom, who’s going to see it there? So, let’s get those important pins to the top. 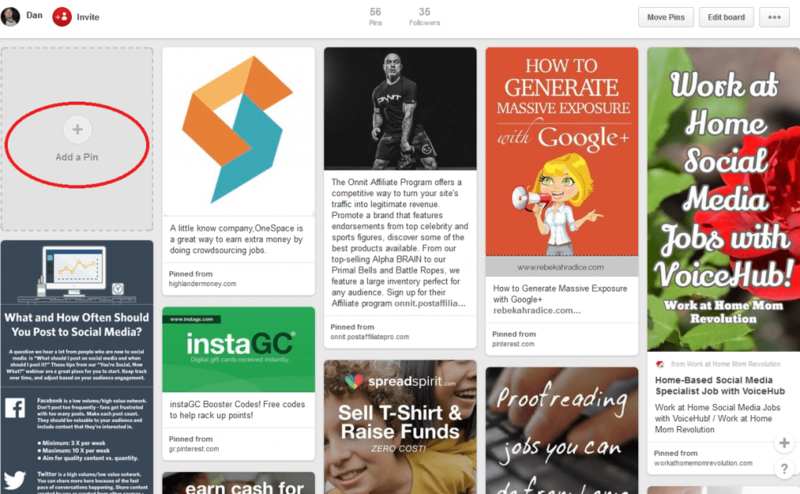 We all have found so many interesting and cool ideas on Pinterest, but it’s more than that. You have the ability to share with the whole world your creations. By making multiple boards and adding pins to these boards. 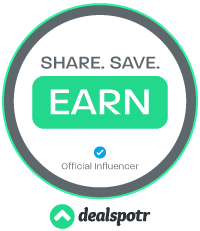 Be it crafts, web pages, ideas, videos, projects, recipes, blog post and much more. If you’re like most people, you want control over the layout of your pins within your boards. The pins you most want to be seen by more people, you want at the top. Without having visitors to scroll down to the bottom to see them. You want them strategically placed! Either to make it more aesthetically pleasing or more able to easily promote. Especially if you want to promote something seasonal, but it’s at the bottom of your board. You would want to move that item to the top. If you try dragging and dropping a pin within your board, to the top it asks you to “Pick a board,” then if you choose the same board you are in, it just makes a copy your first pin. So now you have two copies of the same pin. Then when you click on the new arranged pin it goes back to your original pin, so you have to click more times to get to the pinned website. That won’t work for me! If you are confused about Boards and Pins, I have circled in red below in the pictures to help highlight pins and boards. You can always tell buy what that area says, if it says, “Add a Pin”you’re in your Pins, if it says, “Create a board” you are within your boards. Simple. ***Key Point*** You can move your boards around by dragging and dropping, wherever you want. But you can’t move your pins around by this method of dragging and dropping. I don’t understand why Pinterest can’t let us move pins this way, also. 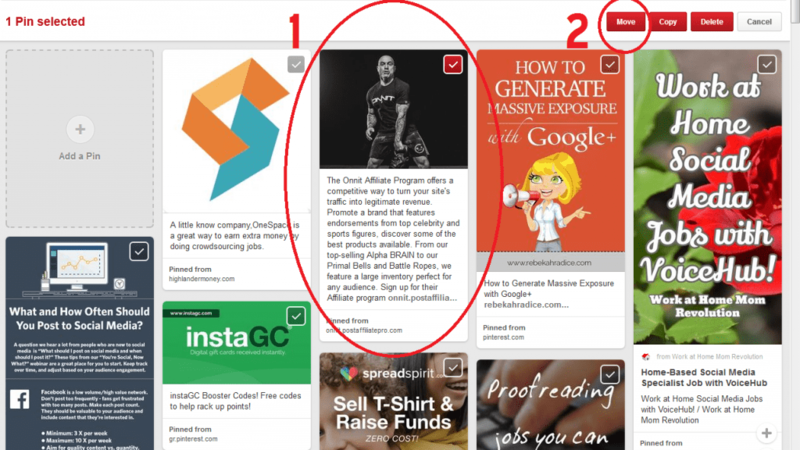 So I am going to show you how to rearrange pins on Pinterest and take back control of the placement of your pins. Once you are on whatever board you want to rearrange, Click the Move Pins button (Circled in red below) located in the upper right-hand side of the screen. Once you click the Move Pins button, every pin in your specific board will now have a greyed out checkmark box in the upper right side of each pin. Next, you can select one or as many pins as you want by checking this box. I chose just one, (1)the one circled in red. Then you click The move button (labeled 2 and circled). After that is done, a new box will pop up and ask you to “Pick a new board for this Pin.” You can either choose the same board you are at or a different one from the pull-down menu. I choose the same board. Then click the move button. Now you will see the pin is moved to the top left in the first position. This will hopefully help keep your most important information easy to see and read. 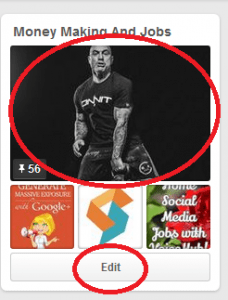 You can also change the cover of any board (The bigger red circle) by selecting the Edit button(smaller red circle). The cover is the larger picture beneath the Board’s name. Then click the Change button.Then flip through the images within that board to pick the right Cover. That’s it. I hope this helps you on how to rearrange Pins on Pinterest. 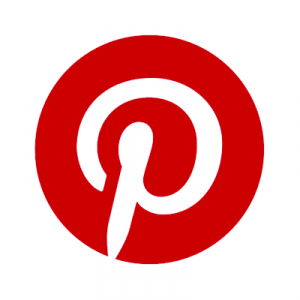 If you want you can also follow me, and I will follow you back, on Pinterest. If you have any other tricks or tips for Pinterest, I would love to hear them. ‹ Is QuiBids A Scam? this does not work. there is no move button in the upper right. ?!?!?!?!?!? Hey Jane, thanks for letting me know, Pinterest has changed a few things but you can still move pins. Click to go inside whatever board you want to rearrange. Then above the title you will see gray colored icons. Pencil, four arrows, and three dots, click the four arrows. There you can pick pins to move or copy. I will update the page soon to remove the confusion. I’ve got the same problem here with moving pins. I can see the four arrows button but it only seems to let you move a pin to another board, rather than within a board. Am I missing something? I’d really appreciate your help please as I need to organise some pins within boards for a Client urgently. Thanks in anticipation. Hey Lynlea, Yeah just move it to the same board that it is in, it will allow you too. You can move a pin to the same board in which it resides and also to other boards if you wish, if you accidentally put it in the wrong board. This will bring it to the front of board (or top) of the board. This is the only way I know of to rearrange the boards. I hope this is clear. Let me know if you get it or need more help. Thanks Dan for the clarification. Pity though it means you have to copy/delete every pin in exactly the right order to re-arrange correctly. Such a polava when you have over 60 pins on a board! No problem Lynlea. I still have to update the page when I find the time. It should be a lot easier to manage your boards than what is currently in order at Pinterest. Pinterest is still a pretty amazing site though, maybe in the future it will be improved upon. Thanks so much for the tip, but I’m doing exactly as you say, and after I select the pin and hit the “move” button, the “Pick a new board for this Pin” box doesn’t show up-nothing happens. What browser are you working in when you are able to do this? Or do you have any other ideas why it might not be working for me? Thanks so much in advance for your time! Amy, I am having the same problem as you I am unable to move the pin, I can highlight (select it) but hit the move button and nothing happens. Sorry, it took so long to get back to you, been real busy. I used both firefox and chrome and nothing worked. Maybe Pinterest is updating something or just bad code. Hopefully fixed soon. I am experiencing the same problem as you are Sue. Even tried a different browser, I tried firefox and chrome, nothing. It was working last month but not now. Keep checking they might fix it in a week or two. They really do seem to have completely ruined it. The boards swap places now, instead of move in a way that makes any sense. It’s really annoying. I tried to move some pins recently and was unable to. Hope they fix this soon. I just tried it right now (4/7/17) and it worked just fine! Guess they fixed the glitch. I only needed to move one pin though, so it was done in a nanosecond, but having to do 60? I’d need to block out some time for that! I do wish Pinterest would create a drag-and-drop feature for pins. People have been grousing about this for years, and certainly the technology is there to make it happen. Till they do, at least we’ve got this strategy– thanks for sharing it Dan! P.S. I was using Safari, in case that makes a difference. Glad to know it’s working again. Glad to help. Glad you found it useful Tracy. I have to get around to updating that page, when I have some free time. Thanks for the repin also. I’ve been doing exactly what you suggest; Move pins to the same board – moves them to the front. However, I notice lately that the moves don’t stick. The day I move the pins, the board is nicely organized. But, the next day, when I go to the board I was working on, the pins are all random. Any thoughts about why that might happen? I followed your instructions and it worked well but is there a way to rearrange all of the pins? I have a sequence of pins on a board and would like to add new pins to bottom of the board not top. I am sorry I do not know of a way to rearrange pins to the bottom of the board. Unless you rearranged the complete board sequence and didn’t touch the ones you want left on the bottom. Thereby leaving the ones you want on the bottom and moving all of the rest to the top of the page. Seems like a lot of work to me but I think this would work. Let me know how this turns out for you. I could share with other people as well. Thanks Suzette for the great question. I am working on an iPad and don’t have all the icons and prompts you are talking about, it appears. I really need to rearrange my boards but have no profile button on the page. I also have a business account if that makes a difference. Any help? Hey Ginger, I unfortunately don’t have an iPad myself and cannot help in this specific questions, but if someone reading this knows the answer, please post below here. If you don’t have a desktop computer maybe go to a local library and use their computer to rearrange the pins. Pinterest needs to make it easy for whatever platform a user uses to easily rearrange their pins. I keep hitting something by accident that shows a different view. The pins are smaller, more are display. I think that’s how you move pins. But now that I want to see the different view, I can’t figure out how to get it. You’re very welcome Marta! Glad to help when I can. Hi Dan! Thank you! I appreciate so very much that you have put this together! I followed your instructions and got to the point where I was going to choose the same board within the list and found that board that is needed is the only one missing out of all of the board options, so I am unable to select it. Are you finding this on your end as well? Again, thank you for helping all of us! When I go to the pin I want to move, I click on the pencil icon (edit this pin) I see the board in which the pin is located and clicking it for me does nothing, I have to move to a separate board then repin it back to the original board to have it at the top of the board. Pinterest has changed things and it has altered the way pins can be moved. Hope this helps. That is what I was afraid of. Thank you for taking your time to respond, Dan! I really appreciate it! This helped to an extent in that I found the move button, but your instructions are slightly incorrect because there is no option to move it to the same board – that board just doesn’t show up in the list of options to move it to. All you can do is move the pin you want moved to another board, then move it back to its original board and it will appear at the top (next to the pin you selected as the cover for that board). Pinterest needs to make it easy to rearrange/reorganize pins in a board. It’s kind of ridiculous that they haven’t done this already. Even the horribly unintuitive facebook lets you rearrange photos in an album. I did this once before by creating a new board with a slightly different name. Then I went through my original board, chose the items I wanted grouped together, and moved them to the new board in groups. 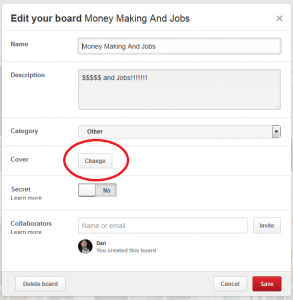 Then you can delete your old board and change the name of the new board if you want. The only trouble with this system is, if you want pins in a specific order, you’ll have to make a list and move the groups in backwards order. And my collage board has 1079 pins! Maybe I need to divide it. Thanks for sharing your experiences and tips,Martha. Thankfully, I don’t have any boards that are as big as your collage board. Wow! Anyone have a vague idea why Pinterest has not resolved this issue? I just joined Pinterest and thought OK next step: arrange the pins on the board…wwwhhhaaattt??? No way to drag I found out first, then after an hour of searching on-line for an answer, found you can’t. Yeah you can make a new board from your board to get your pins organised, but then when you want to add a pin, you can’t put it in order. Why would they do this to us? I feel your pain Marcy. It’s really frustrating!!! !Pinterest needs to figure this out, they are too big of a website not to solve this problem. They need to pay some money to get this simple problem worked out to satisfy their users.